Revenue in the Trains & Busses segment amounts to US$48,024m in 2019. Revenue is expected to show an annual growth rate (CAGR 2019-2023) of 6.4%, resulting in a market volume of US$61,545m by 2023. User penetration is 7.9% in 2019 and is expected to hit 9.6% by 2023. The average revenue per user (ARPU) currently amounts to US$82.45. In global comparison, most revenue is generated in United States (US$7,386m in 2019). The Trains & Busses segment consists of tickets for long-distance travel or cross-regional travel by train or bus. This includes country-specific providers of passenger rail transport and bus companies e.g. Eurolines, National Express and Greyhound. As a rule, travel for single passengers and groups or time-limited subscription based travel can be booked up to a year in advance. Users represent the people who have booked the bus and train tickets, independent of the number of travelers on the booking. Offline bookings made, for example, in a travel agent’s office or by telephone or at an automated payment point are not included; a prerequisite for this segment is an online checkout process on the booking website of the transport provider. Furthermore, tickets for public transport, for within city, or other local travel, and not included. Reading Support Revenue in the Trains & Busses segment amounts to US$48,024m in 2019. Reading Support The Trains & Busses segment is expected to show a revenue growth of 8.2% in 2020. Reading Support In the Trains & Busses segment, the number of users is expected to amount to 736.3m by 2023. 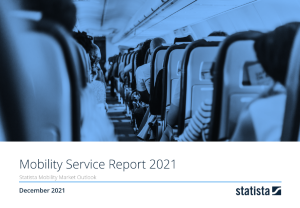 Reading Support User penetration in the Trains & Busses segment is at 7.9% in 2019. Reading Support The average revenue per user (ARPU) in the Trains & Busses segment amounts to US$82.45 in 2019. Reading Support In the year 2017 a share of 33.5% of users is 25-34 years old. Reading Support In the year 2017 a share of 52.8% of users is male. Reading Support In the year 2017 a share of 39.2% of users is in the high income group. Reading Support With a market volume of US$7,386m in 2019, most revenue is generated in United States. Reading Support With a rate of 33.9%, the user penetration in the Trains & Busses segment is highest in Sweden. Here you can find more studies and statistics about "Trains & Busses".